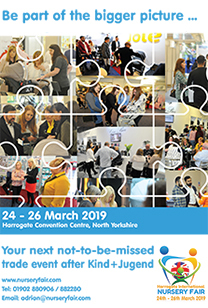 The nursery industry can look forward to the biggest Harrogate Nursery Fair ever with stand space reserved by over 200 exhibitors. The fair is nearly booked out with Halls A, B, C, M and Q completely full and the last few remaining spaces filling fast in Hall D.
This year, visitors can expect a truly international show with a significant increase in overseas exhibitors plus many new UK companies showing their products for the first time. There are also many new product launches from almost every major nursery company. 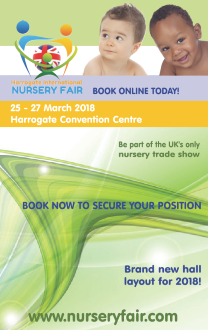 For retailers looking for innovative new products and to be amongst the first to view the latest launches from the big names in the nursery industry, Harrogate Nursery Fair provides a one-stop-shop and is a must for any buyer in the nursery trade to visit. The Baby Products Association has opened its’ 2011 Concept & Innovation awards program that encourages product innovation within the nursery sector. For the finalists over the past seven years, it has proven to be a key channel for promoting and even launching their new products. The BPA invites everyone with a nursery product that is unique, in concept or application, to enter the awards. Whether you are a student with a new concept that will challenge the boundaries of technology and design or an entrepreneur with a new product that will fill a gap in the market, becoming a finalist in the BPA Concept & Innovation awards will provide you with an ideal platform to launch your product. The chosen finalists will be given a fantastic opportunity to showcase their designs at Baby Show for Trade held at London Olympia 16th to 18th October 2011. Past winners include Jackson Beazeley Ltd who won the 2008 BPA Concept & Innovation award for their product The Wean Machine. The company has had significant growth since winning the award and the product is now available in over sixty countries. The 2009 award winner, Claire Mitchell MD of Chillipeeps recently updated us on her progress: “Since winning the Concept & Innovation award in 2009, we received fantastic feedback from industry professionals across the globe and decided to take the product to market. Entering and winning the BPA Awards was the single best step we made during development.” Chillipeeps received such a positive reception from the industry that the unique feeding device will be launched at Harrogate Nursery Fair on stand Q28. These winners are shining examples of the Association’s endeavor to bring new innovative ideas to the attention of the industry. For further information about these awards, please contact Julie James on 0845 456 9570 or Julie@b-p-a.org. The closing date for all entries is Friday 1st July 2011.